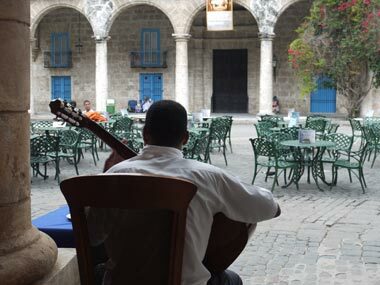 Accommodation for this tour can be in hotels or casas particulares (private Cuban homes) or a mixture of both. The length of the tour can be extended. Meet and greet at Havana airport terminal 2 (if you are coming on a direct charter flight from Miami) or terminal 3 if coming via a third country. Transfer in private coach to hotel in Havana. Dinner included. Events during the day depends on when your flights arrive in Havana. Walking guided tour of old Havana to see the important sights and the four main squares. Then drive to the fishing village of Cojimar and have a cooking lesson at a local paladar (Cuban private restaurant) followed by lunch at the same paladar. Return to hotel for some free time after lunch, then we have a cocktail at the Ludwig Art Foundation in Vedado with great views over Havana and the sea from the lovely 1950s terrace. We will meet some young contemporary up and coming artists and some artists already established. Their work can be purchased and exported to the USA. Dinner at a paladar in Havana. Visit the Cuban section of the Museum of Fine arts in Havana with a private curator giving the tour. Afterwards, we visit the lovely home of a lady who has assembled a good collection of Cuban Art, mostly contemporary, the works are for sale. We have a simple lunch at her gallery. After lunch we meet with a Cuban photographer who takes us to some interesting places in Havana to photograph and can help us with our technique. Dinner tonight at Cafe Oriente, a super restaurant in the San Francisco square. Visit to the ISA school of art to see the students working in their studios. This is an architectural must and the school was designed by a famous architect at the beginning of the Revolution. Lunch is at the village of Jaimanitos in the Gaudiesque surreal wonder of artist Jose Fuster who has literally plastered houses, bus shelters and streets with his mosaic art for the benefit of the community. After lunch we visit an Organiponico, an organic market garden. Free evening with suggestions where to eat. We depart Havana with the guide for a day visit of the Vinales area west of Havana with the most amazing landscapes. En route, we stop at the Las Terrazas community nestling in the sierra Rosario hills where we visit the Artists’ colony and community. In Vinales, we have lunch at a fascinating organic restaurant in an old house situated on a hill overlooking the Mogotes, the strange and beautiful tall limestone outcrops which are reminiscent of an oriental landscape. We have a short tour of the farm garden. After lunch, we visit a tobacco plantation and even sample a cigar. Spend the afternoon touring the Vinales valley and return to Havana. Transfer to Havana airport for your flight home.